Tonight that wondrous star shines bright. 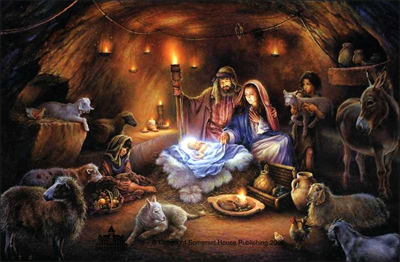 For away in a manger is the birth of Christ. In that holy town of Bethlehem, in the stillness of the night. Lay Virgin Mary, her husband Joseph and the newborn babe called Christ. It was a long time ago that holy night. When all seemed dark with loss of light. God send Christ, his beloved son. To bring peace on earth we have not yet won. To bring faith, hope and charity into our mortal hearts. With these wondrous gifts from Christ we must never, never part. For if one is lost, you are left to go astray. Ask for help morn and night, ask forgiveness when you pray. You’ll be forgiven have no fear. For Christ is watching He is always near. Then deep within your heart you’ll find. Love for God and all mankind. For if two is lost, your faith and hope are gone. Slow down and think what happened and where you have gone wrong. Think of how you live, the mistakes you made in life. The sooner that you realize this, the closer you’ll be to Christ. His heart is always open for those who do believe. When you become a part of Him, you’ll know, you’ll never leave. For if all is lost, then you are lost. Selling your soul to hell not caring what it cost. If you don’t care, don’t believe in Christ. The sorrows you feel will be great in life. Yes, the gift of life can never compel. To those torturous flames those arms of hell. Is you, your body and soul and just the adding of Christ. Now there is nothing left for me to say. Except God Bless you all on this Christmas day!